Nick Bilton has landed himself a gig as “special correspondent” for Vanity Fair, and by God doesn’t he want you to know it. Not satisfied with lining up press interviews to talk about his new job -- press interviews! -- now Bilton has decided to neg his former colleagues in the tech press to make absolutely sure they're paying attention, and to show his bosses that he can deliver the young, hip Valley eyeballs he promised at his job interview. What other explanation could there be for his latest column, eastcoastsplaining that the Theranos scandal was all the fault of the Silicon Valley tech press? If you peel back all of the layers of this tale, at the center you will find one of the more insidious culprits: the Silicon Valley tech press. They embraced Holmes and her start-up with a surprising paucity of questions about the technology she had supposedly developed. They praised her as “the next Steve Jobs,” over and over (the black turtleneck didn’t hurt), until it was no longer a question, but seemingly a fact. At TechCrunch Disrupt, blogger Jon Shieber had his blood drawn onstage as he interviewed her. There were no tough questions about whether Theranos’s technology actually worked; just praise. When it seemed that the tech press had vetted Holmes, she subsequently went mainstream. She got her New Yorker profile, and her face appeared on the cover of T: The New York Times Style Magazine, among others. Attentive readers will have noticed the (first) glaring flaw in Mr Bilton’s blaming of the “tech press in Silicon Valley” for the rise of Theranos. Of the publications he cites by name -- the New Yorker, T: The New York Times Style Magazine, TechCrunch -- only one is actually a tech publication based in Silicon Valley. That’s a curious thing for Bilton to be confused about given that the Times is his own former employer. And that confusion turns to unmitigated nonsense when Bilton narrows the focus of his criticism further, to publications that rely on access to tech celebs for conferences. So why did Holmes and Theranos get such a break? Was she an anomaly who somehow pulled one over on the tech press in Silicon Valley? Not even close. Helpfully for Bilton, that narrowing of focus rules out Buzzfeed, The Verge and Wired, all of which do great investigative tech reporting of the type he claims doesn’t exist. Arguably it could still include Pando -- we do have a conference after all -- but it’s not often we’re accused of going too easy on tech companies. Certainly, our scepticism over medical devices is not in question. Really, then, the only two publications Bilton could possibly be referring to are TechCrunch and Re/Code. Both failed to criticise Theranos and both rely on access journalism to ensure a steady supply of conference speakers. They are the ones that Vanity Fair’s special correspondent blames for allowing Theranos to exist! And yet, notice only one of those publications gets name checked: TechCrunch. Why does Re/Code get a pass? Perhaps it has something to do with the fact that Kara Swisher, when she’s not busy editing Re/Code, is another special correspondent for... Vanity Fair. In fact, it was Swisher who famously wrote one of the most grotesque apologias for Uber’s Travis Kalanick, just days before it was revealed that Uber had a secret plan to smear critical journalists including Pando’s Sarah Lacy. Swisher didn’t write it for "Silicon Valley tech publication" Re/Code, mind you. She wrote it for "employer of Nick Bilton," Vanity Fair. Now compare Sales’ excellent reporting with these puff pieces written about the same founder and same company by Vanity Fair’s Kara Swisher and Nick Bilton and you start to wonder if the magazine has deliberately hired Swisher and Bilton to balance out its existing critical journalim and curry favor with the west coast billionaires. Y’know, the kind of billionaires who would love to believe that it’s the nasty old tech press that’s to blame for their own bad behavior. But, in fairness, Bilton’s complaints aren’t about Uber or Tinder, they’re about Theranos. Buried deep in Mr Bilton’s column is an admission that, yes, Vanity Fair has written about Theranos too. 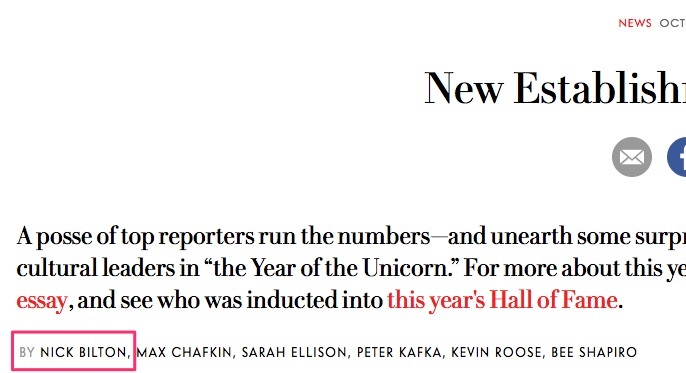 In fact, founder Elizabeth Holmes was included in the magazine’s “New Establishment” list of “ the most important visionaries, investors, and cultural leaders in 'the Year of the Unicorn.'". What was it Bilton said about “Silicon Valley” reporters? There were no tough questions about whether Theranos’ technology actually worked; just praise. 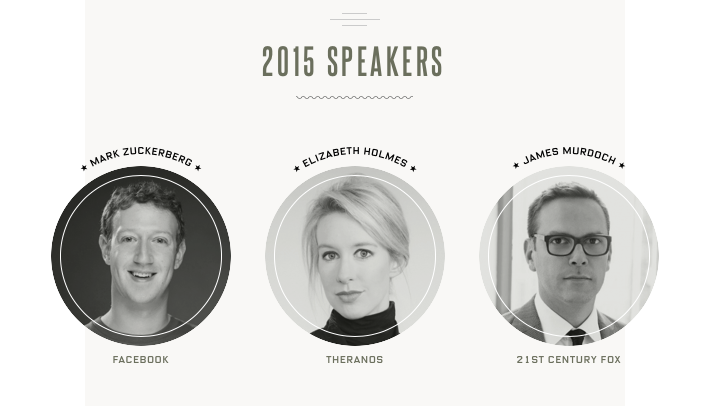 Who's this at the top of the speaker page of Vanity Fair's New Establishment conference…? Yep, if Re/Code and TechCrunch are to blame for giving Theranos an easy ride then they pale next to the sedan chair provided by Vanity Fair. Special correspondent, go heal thyself.